WordStream’s Google AdWords Tools are the ultimate tools for competitive search marketers looking to save time and get better results from their AdWords campaigns. By helping you work faster and smarter, WordStream’s AdWords tools make optimizing your campaigns inAdWords a snap, and will raise your productivity, boost your Quality Score, improve your conversion rate and lower your pay-per-click advertising costs. 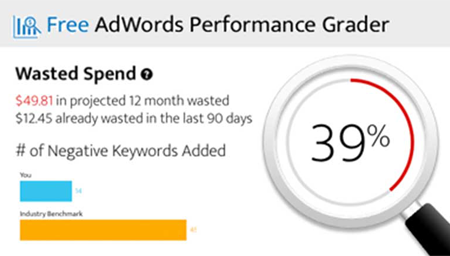 Wordstream’s AdWords Performance Grader is a comprehensive free AdWords tool that helps you evaluate how your AdWords campaigns are performing on several key criteria. The AdWords Performance Grader provides free, expert analysis, showing you where and how to make improvements to your AdWords campaign that will improve your performance and save you money. The AdWords Performance Grader is an incredibly valuable tool for AdWords, uncovering the AdWords secrets you need for success. The quality and performance of your landing pages affects your Google AdWords Quality Scores – the “grade” that Google uses to determine how well your ads rank on the search engine results page, as well as how much you pay per click. Since your Quality Scores have such a big impact on the success or failure of your PPC campaigns, it’s crucial to get the landing page component right. After all, without effective landing pages, you can’t seal the deal. It doesn’t matter how good your ads are if your landing pages don’t work. The AdWords Landing Page Grader is the only landing page tool of its kind. It’s the fastest, easiest way to perform a PPC audit of your landing pages and get deep insight into how they’re performing. WordStream Advisor is an easy-to-use, time-saving platform that helps businesses of all sizes optimize their AdWords campaigns for better results. The core feature is the 20-Minute PPC Work Week, a system of alerts that makes finding and fixing mistakes in your AdWords account, as well as acting on big opportunities, as fast and easy as possible. Our Quality Score management tools are uniquely designed to boost Quality Scores in Google AdWords campaigns. These tools help you implement proven best practices that raise your click-through rates (CTR) and increase the relevance of your ad groups and PPC ads. These scalable tactics help you raise Quality Scores fast, improving ad rankings and lowering advertising costs. The 20-Minute Work Week includes automated tools to help you save money on AdWords, including alerts that show you when a keyword has an unusually expensive cost per click (CPC) and is not returning conversions and ROI. You'll also get tips on when to add negative keywords so that you don't have to spend your limited budget on irrelevant keywords that won't convert. WordStream's ad optimization tools identify underperforming ads and make recommendations, based on proven best practices, so you can improve your ad copy and raise your AdWords click-through rate. Without the right tools, bidding can be one of the most complicated and time-consuming parts of AdWords management. WordStream's automated bidding tools for AdWords make weekly recommendations for bid adjustments to improve your ad rankings and results. Powerful AdWords Tools: Check Them Out for Yourself at No Cost! With WordStream, you get powerful, easy-to-use AdWords tools, marketing graders and keyword discovery tools that make pulling in qualified traffic that much easier. WordStream provides the PPC and AdWords help you need. Watch as your Google AdWords PPC campaigns begin to generate more leads, more sales and more profit with less effort. To learn more about the WordStream AdWords tool suite and see the benefits for yourself, try WordStream free today.